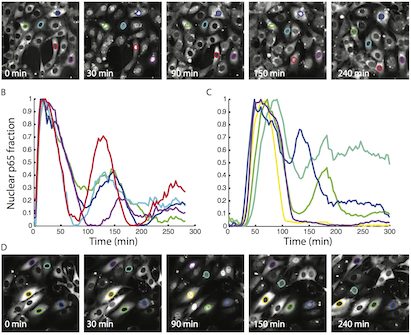 Nearly identical cells can exhibit substantially different responses to the same stimulus. We monitored the nuclear localization dynamics of nuclear factor kappaB (NF-κB) in single cells stimulated with tumor necrosis factor-α (TNF-α) and lipopolysaccharide (LPS). Cells stimulated with TNF-α have quantitative differences in NF-κB nuclear localization, whereas LPS-stimulated cells can be clustered into transient or persistent responders, representing two qualitatively different groups based on the NF-κB response. These distinct behaviors can be linked to a secondary paracrine signal secreted at low concentrations, such that not all cells undergo a second round of NF-κB activation. From our single-cell data, we built a computational model that captures cell variability, as well as population behaviors. Our findings show that mammalian cells can create “noisy” environments to produce diversified responses to stimuli.